Given it’s similarities to Earth, Mars is often referred to as “Earth’s Twin”. Like Earth, Mars is a terrestrial planet, which means it is composed largely of silicate rock and minerals that are differentiated into a core, mantle and crust. It is also located within the Sun’s “Goldilocks Zone” (aka. habitable zone), has polar ice caps, and once had flowing water on its surface. But beyond these, Mars and Earth are very different worlds. In addition to their stark contrasts in temperature, surface conditions, and exposure to harmful radiation, Mars also takes a significantly longer time to complete a single orbit of the Sun. In fact, a year on Mars is almost twice as long as a year here on Earth – lasting 686.971 days, which works out to about 1.88 Earth years. And in the course of that orbit, the planet undergoes some rather interesting changes. Mars represents something of a conundrum for scientists. In many respects, it is significantly different from Earth. It’s cold, it’s dry, there is little atmosphere or precipitation to speak of, and nothing grows there. By our standards, that makes it an incredibly inhospitable place. And yet, in many other respects, it is quite similar to our world. For instance, Mars’ internal structure is differentiated between a metallic core and a silicate mantle and crust. It also has plenty of water, though the majority of it is concentrated in the polar regions as water ice (and as a permanent layer of permafrost under much of the surface). But perhaps most striking of all, a day on Mars is almost the same as a day here on Earth. In fact, a day on Mars is roughly 40 minutes longer than a day is here on Earth. Compared to other bodies in our Solar System where a day is either incredibly short (Jupiter’s rotates once on its axis every 9 hours, 55 minutes and 29.69 seconds) or incredibly long (a day on Venus lasts for 116 days and 18 hours), this similarity is quite astounding. However, there are some things that need to be addressed before we go about declaring just how long a day is on another planet. In fact, there are two ways to determine the length of a day on a celestial body, the sidereal day and the solar day; both of which are used by astronomers for determining the passage on time. By definition, a sidereal day on Mars is the length of time that it takes the planet to rotate once on its axis so that stars appear in the same place in the night sky. On Earth, this takes exactly 23 hours, 56 minutes and 4.1 seconds. In comparison, on Mars, a sidereal day lasts 24 hours, 37 minutes, and 22 seconds. The solar day, by contrast, is the time it takes for the Earth to rotate on its axis so that the Sun appears in the same position in the sky. This position changes slightly each day, but on Earth, a mean solar day works out to being 24 hours long. On Mars, a solar day lasts 24 hours, 39 minutes, and 35 seconds. Rounding that out, we say that a day here on Earth works out to an even 24 hours while on Mars, a day lasts 24 hours and 40 minutes. Want to know about some other interesting similarities Mars has with Earth? Read on! Mars also has a seasonal cycle that is similar to that of Earth’s. 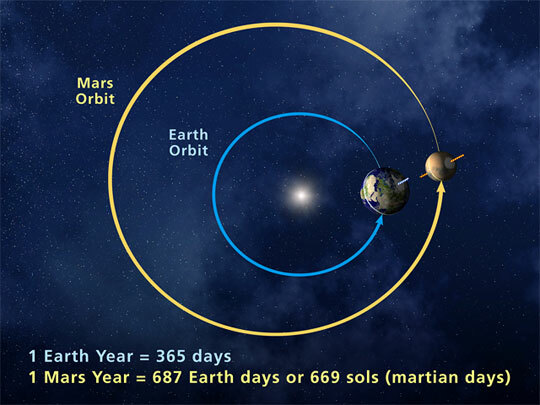 This is due in part to the fact that Mars also has a tilted axis, which is inclined 25.19° to its orbital plane (compared to Earth’s axial tilt of approx. 23.44°). It’s also due to Mars orbital eccentricity, which mean that it ranges in distance from 206.7 million to 249.2 million kilometers from the Sun. This change in distance causes significant variations in temperature. While the planet’s average temperature is -46 °C (51 °F), this ranges from a low of -143 °C (-225.4 °F) during the winter at the poles to a high of 35 °C (95 °F) during summer and midday at the equator. This high in temperatures is what allows for liquid water to still flow, albeit intermittently, on the surface of Mars. It also snows on Mars. In 2008, NASA’s Phoenix Lander found water ice in the polar regions of the planet. This was an expected finding, but scientists were not prepared to observe snow falling from clouds. The snow, combined with soil chemistry experiments, led scientists to believe that the landing site had a wetter and warmer climate in the past. And then in 2012, data obtained by the Mars Reconnaissance Orbiter revealed that carbon-dioxide snowfalls occur in the southern polar region of Mars. For decades, scientists have known that carbon-dioxide ice is a permanent part of Mars’ seasonal cycle and exists in the southern polar caps. But this was the first time that such a phenomena was detected, and it remains the only known example of carbon-dioxide snow falling anywhere in our solar system. In addition, recent surveys conducted by the Mars Reconnaissance Orbiter, the Mars Science Laboratory, the Mars Orbiter Mission (MOM), the Mars Atmosphere and Volatile Evolution (MAVEN) and the Opportunity and Curiosity Rovers have revealed some startling things about Mars’ deep past. For starters, soil samples and orbital observation have demonstrated conclusively that roughly 3.7 billion years ago, the planet had more water on its surface than is currently in the Atlantic Ocean. Similarly, atmospheric studies conducted on the surface and from space have proven that Mars also had a viable atmosphere at that time, one which was slowly stripped away by solar wind. Like Earth, Mars can have some pretty extreme weather. In the Red Planet’s case, this takes the form of dust storms that can dominated the surface from time to time. These storms have been known to grow to be thousands of kilometers across, occasionally encircling the entire planet and covering everything in a thick haze of dust. When these storms become that large, they prevent direct observation of the Martian surface. Case in point: when the Mariner 9 orbiter became the first spacecraft to orbit Mars in 1971, it sent pictures back to Earth of a world consumed in haze. The entire planet was covered by a dust storm so massive that only Olympus Mons, the giant Martian volcano that measures 24 km high, could be seen above the clouds. This storm lasted for a full month, and delayed Mariner 9‘s attempts to photograph the planet in detail. Therein lies another thing Mars has in common with Earth – global warming! Much like warming trends here on Earth, warming on Mars is caused by the presence of particulate matter in the air that absorbs energy from the Sun and radiates it outward into the atmosphere. causing average temperatures to rise. These storms tend to occur when Mars is closest to the Sun, and are the result of temperatures rising and triggering changes in the air and soil. As the soil dries, it becomes more easily picked up by air currents, which are caused by pressure changes due to increased heat. The dust storms cause temperatures to rise even further, so you could say Mars has a “greenhouse effect” of its own! As you have probably concluded from all the facts listed above, Mars can be a harsh and volatile planet. Just knowing the answer to ”how long is a day on Mars?” only provides a small glimpse of what is going on there. At the end of the day (no pun intended!) there is plenty happening on Mars that makes it similar enough to Earth that many people are actually contemplating living there someday. And knowing exactly what sets Mars apart, and what we can work with, will be intrinsic to making that happen! We have written many interesting articles about Mars here at Universe Today. Here’s one about Mars Compared to Earth, the time it takes to get to Mars, how strong the gravity is on Mars, and how many moons Mars has. Want more information? Learn about living on Mars time, which can you do by consulting NASA’s clock for calculating Martian time. Finally, if you’d like to learn more about Mars in general, Astronomy Cast has some episodes about the Red Planet, like Episode 52: Mars, and Episode 91: The Search for Water on Mars.